Now that we've gotten the inflammatory headline out of the way, I still believe there's some truth to it. It's been my experience that when the topic of playing Old School or even Vintage for that matter comes up, lots of folks can talk a big game. But when given the opportunity to actually do it, they are suddenly nowhere to be found. So why does Old School scare people? Because they don't understand it. They look at the Old School players with a sense of awe. Like seeing a living relic from a bygone time. You can almost hear the hushed whispers as you walk into a room... "You know, he play's Old School." They've most likely never played the cards casually wielded by Old School players before. All varieties of Moxes played as a common land would be. Chaos Orbs casually tossed about with devastating results and nobody bats an eye. For some, it's their first time even seeing some of those cards. There's something "mystical" about watching an Old School game unfold. It's not like watching a game today. It's a completely different feel watching two Old School players battle it out. Witnessing two battle hardened wizards duel it out from a time long forgotten has a tendency to make people stop and watch. Despite not really understanding it, those same people can certainly talk a big game. They lament about all the overpowered cards back then and tell you how the game was so unbalanced and people got killed all the time on the first turn.They can tell you exactly what they'd do on the first turn to kill you right there. You wouldn't even need to draw your first hand, they'd make such short work of you. All this despite the fact they probably hadn't even been born yet when those games were being played. But something happens when you ask them to play and show you how it's done. Young Gunslinger: "Blah, blah, blah, overpowered... blah, blah, blah... I'd just play XYZ..."
Me: "Sounds good to me, want to play some Old School then?" Young Gunslinger: "I uh, I don't have those cards." Me: "No problem, proxy whatever cards you want and let's play." Young Gunslinger: Uhhhh, well, I uh..."
And that's usually how it ends. I'm still waiting for the one person to say, "okay!" Nowadays , I suspect most people have really only ever heard of Old School in passing. And I can understand that, it's not a commonly supported format. It's no like everyone is playing it. It's like speaking Latin, it's been effectively dead for years. I want to say it's growing, but that's hard to say because I don't know if it really is. Only time will tell. What I find myself doing most of the time is educating people about the format. Explaining the history of the game and how it existed in the beginning. How Old School got to where it is today and why us "Old Schoolers" play the format. Sometimes I feel like an old wizard teaching a new wizard. I try to dispel some of the myths surrounding Old School. Not every game ended on the first turn with one person killing the other. Sometimes I get through, sometimes it falls on deaf ears. I do know that if I want to keep playing Old School, I have to do my part to help keep it alive. 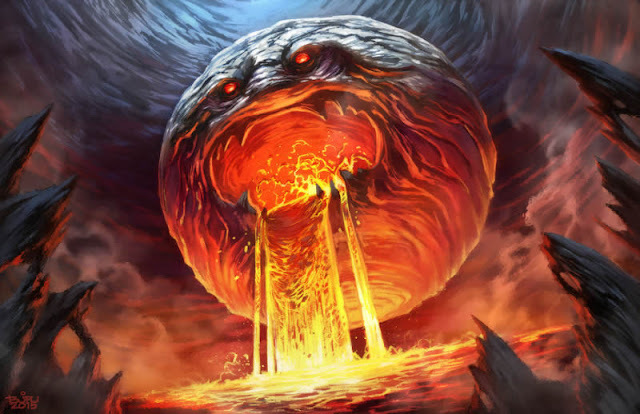 IMAGE: Chaos Orb Illustration by Brian Valeza. Scary just like Old School Magic players.